Power up the Batmobile! It’s the ultimate fighting force! 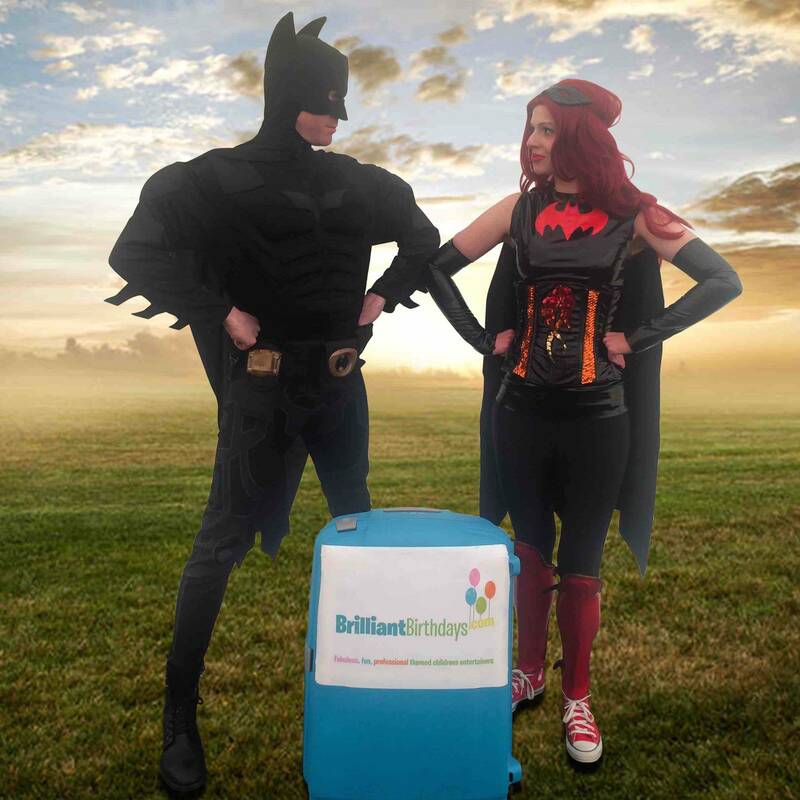 It’s the Batman and Batwoman lookalike childrens themed party entertainment! Pow! 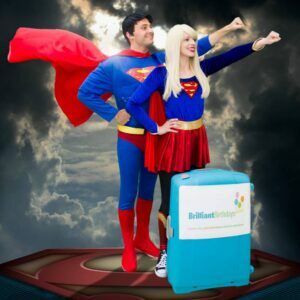 Diving into action our childrens entertainers London will fly in and save the day at your party. 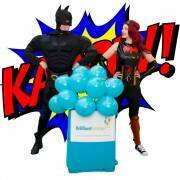 Have our childrens entertainers London swoop down as Batman and Batwoman at your kids party. 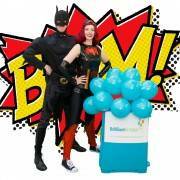 Pass the Batman parcel in pass the parcel, shake a shiney pompom with Batwoman, and get flexible with the Batman limbo. 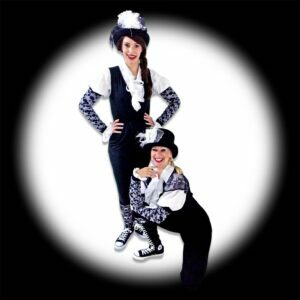 You’ll marvel at our childrens entertainers London. 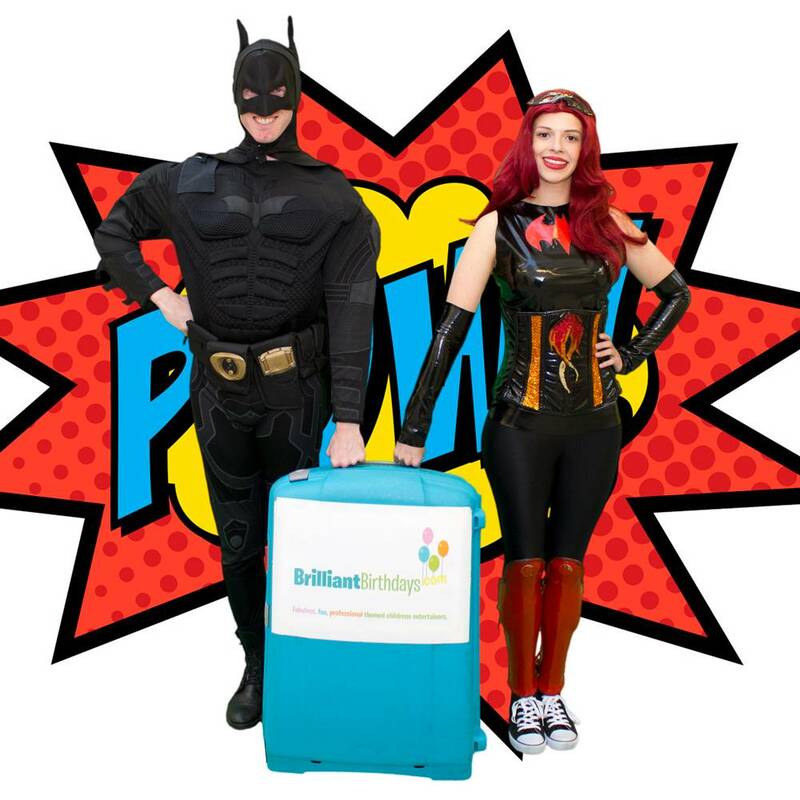 Their super hero ability to captivate and entertain the kids is the best you’ll find in all of Gotham City. This party is perfect for boys and girls and provides the perfect stress-free solution for your party. 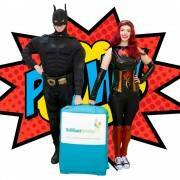 The Batman and Batwoman Lookalike childrens themed party entertainment can zoop-up your party for one, two or three hours to suit your party needs. 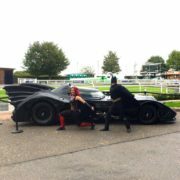 The games played in the Batman and Batwoman Lookalike childrens themed party will vary depending on how long is booked. The Batman and Batwoman childrens themed party entertainment thrill and entertain upto a maximum of fifty children per party. The Batman and Batwoman Lookalike childrens themed entertainment can cruise their batmobile to a Central London or Greater London location. 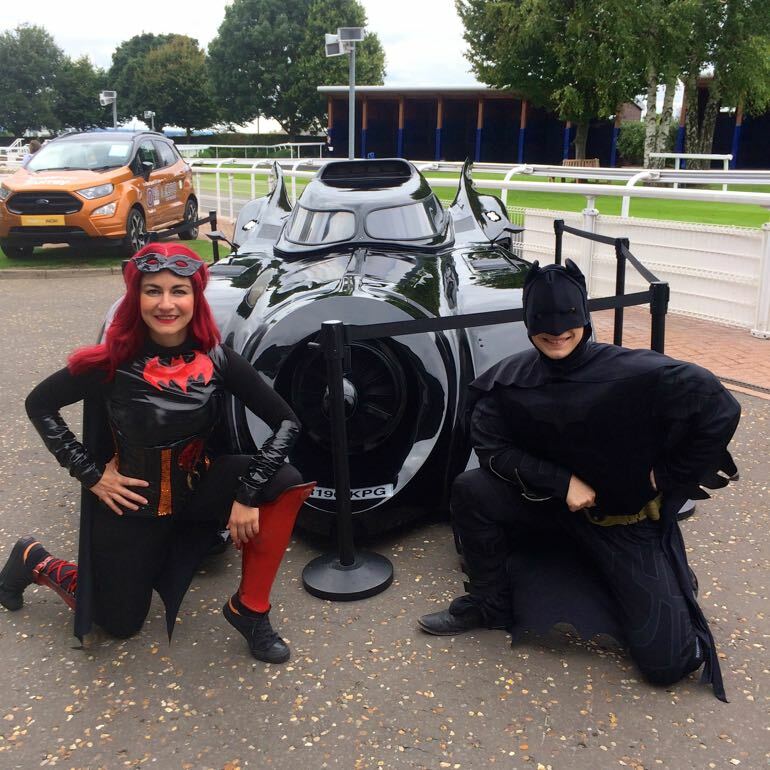 If the Batman and Batwoman Lookalike childrens themed entertainment party will be swooping to a venue outside the M25 there will be a charge of 40p per mile from and back to the M25. 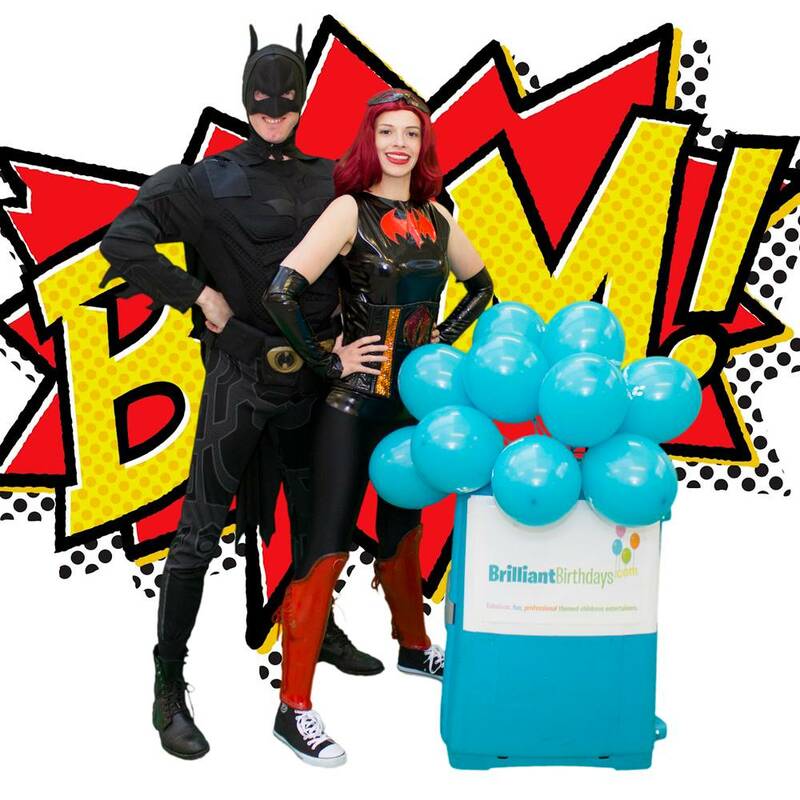 So for a party of epic proportions and all the excitement of Gotham City, book your Batman and Batwoman Lookalike childrens themed entertainment now! The 2 entertainers, I only saw them at the beginning when I had to welcome them. They came early, they looked the part and they were professional. They even looked great in pictures! I didn’t get to see any of the entertainment as I was extremely busy with attending to guests for all sorts. However I have since seen a few video clips and I know the kids were occupied and thoroughly entertained. In all, it was a fantastic Brilliant party and I would easily recommend you to anyone. I suspect you already got prospective clients on the day anyways. Thank you so much for all your help in achieving a great party and a big thank you to your wonderful team. Brilliant Birthdays was a great hit at my son’s 2nd birthday! Batman came along with Batwoman and they were very engaging. They did a lots of games and activities and they even gave out the balloons on stick to 50 children. We all had a great time. Thank you for your service. Batman and Batwoman were brilliant. It was a lovely party and all the children enjoyed it. A lot of great feedback from parents too. Thank you Brilliant Birthdays! 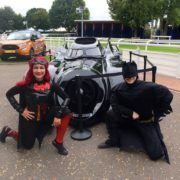 Batwoman and Batman were just fabulous! Thank You for san amazing party to remember forever. What a lovely party we had last weekend! We booked Batman & Batwoman lookalike Party and it was wonderful. The entertainers were impressive! They managed to have all the children having so much fun! Very nice and smooth party with 40 children invited 🙂 Many Thanks Brilliant Birthdays! 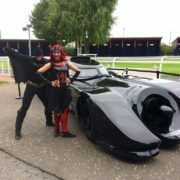 We had an amazing experience at our Batman & Batwoman lookalike Party. Children had a lots of fun with their favourite superheroes! Thank you! 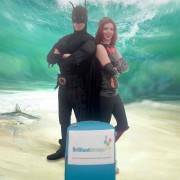 We got BAT DUO last Saturday & it was great fun. They kept the kids & adults entertained the whole time. I would definitely recommend Brilliant Birthdays to others. Massive thank you! Thank you very much for coming for my twins bday party recently! Well done for making the little ones really happy ! Thank you! Great day for my son, Ben! Entertainers were Brilliant ! Thank you! 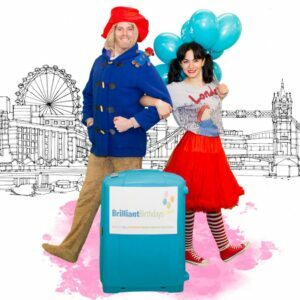 Booked Brilliant Birthdays for my daughters 4th Birthday. We have used your service twice now and it’s fast becoming an annual tradition. Lots of parents at the party commented on how good the entertainers were. Brilliant service! Highly recommended! Amazing team to work with. 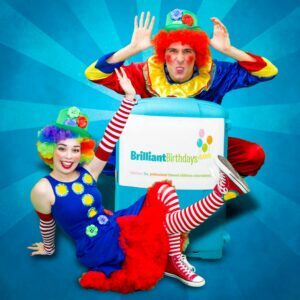 I worked with Brilliant Birthdays 3 year in a row now! ! Entertainers were always amazing!